1:22 aborting for -2 ; I got sucked into a congestion - and it stalled. I get out and wait. 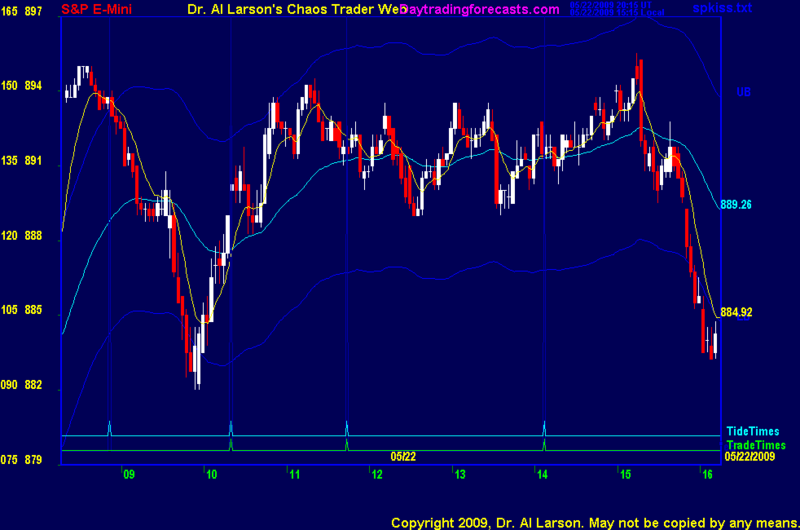 10:04 this is more volatility than I expected on a pre holiday session; the question is, "Will it continue?" 9:56 note that the price bars on the MTRainbow chart are red during a decline and white during a rally. 5/22/2009 2:30:59 PM MT cgm:: what wsa that website al mention....the preacher in texas? 5/22/2009 9:11:10 AM MT AMBG:: I see what you're saying - obey the larger trend. 5/22/2009 9:08:00 AM MT Ahab****:: Seriously...my take on the XGO pattern for next week is that this modestly up/consolidation pattern will have a downward bias. From past observations it’s important to step back and look at the longer XGO forecast. We just passed an XGO high. A XGO forecast which shows consolidation after a decline would make one think that prices would hold up and maybe they will. But with a forecasted low down the road my experience with XGO makes me believe that this modestly up/consolidation forecasted pattern will have a downward bias. 5/22/2009 8:50:01 AM MT AMBG:: Thanks acetd. 5/22/2009 8:49:56 AM MT Ahab****:: Thats an easy question to answer....I am short. 5/22/2009 8:38:35 AM MT AMBG:: Ahab, how you reconcile that when XGO shows market holding up into next week? 5/22/2009 8:33:52 AM MT Ahab****:: The market is still trading a short distance either side of Saturn at 885. The Mars Venus area has been generating some energy and sharp but short rallies. Maybe Mars will set the high. If prices drop from that level and go through Saturn at 885 there isnt really a lot of support until that Jupiter, Chiron, Neptune conjunction at 866. The Sun is at 872 and could provide some support as it did yesterday. This is just one of many possible scenarios but its the one that appears most probable to me.I do believe we get to 866 if not today....soon. 5/22/2009 7:28:17 AM MT DP****:: GM All. Thanks for the chart Al. Have a great day.